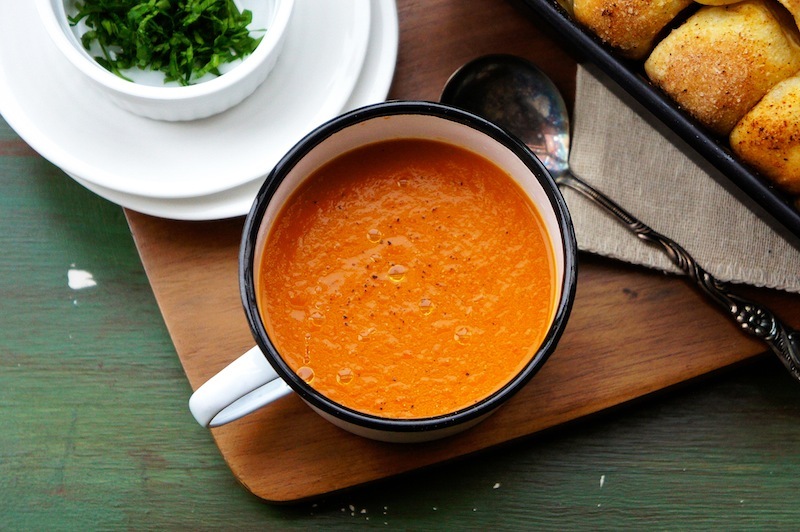 This hearty and heartwarming Roasted Vegetable Soup is just wonderful, and it's an ideal soup for vegetarians too. The soup has a wonderful natural sweet flavor from the caramelize red peppers, eggplant, tomatoes, onions, and garlic. For a complete meal, you may serve it warm with your favorite bread or with some Garlic Cheese Pull-Apart Pizza Bread on the side. The recipe for the Pizza Bread will be available on my next post. In a large roasting pan, combine red peppers, tomatoes, onion, garlic, chili flakes, oil, sea salt, and black pepper. Arrange the peppers and tomatoes skin side up. Wrap the eggplant with aluminum foil. Roast in the oven for about 40 minutes, or until all the veggies are fully cooked and tender. Remove from the oven and let the eggplant to roast for another 15 minutes. Place the peppers in a large bowl and cover with plastic wrap. Leave it for about 5 minutes, scrape of the skin with a knife or your hand. Reserved any juices in the bottom of the bowl. Peel the tomato skins and squeeze out the garlic. Remove the eggplant from the oven, let cool slightly and scoop out the pulp and discard the skin. Coarsely chop all the vegetables and place in a pot together with the broth. Bring it to a boil and simmer for about 10 minutes. Let the mixture cool slightly and blend until they are smooth and velvety. Return the soup to the pot and warm up gently and season with salt and pepper, if desired. Serve the soup warm. I swear there is nothing better than the flavor of roasted vegetables. The last one I made into a soup just had tomato so I can't wait to try this!